Foam encapsulates gases in liquid lamella. The force needed to deform the lamella causes the foam to flow with high pressure drops. Thus, foams are widely used for fracturing fluids and air drilling. Significant effort has also been spent on use of foam as a method of reducing mobility of gases. Gases are low-density fluids with high mobility which preferentially rise to the top of a formation or move through high perm zones. Thus, reducing the mobility of a gas would slow gravity override and help disperse gas from high-permeability channels to improve sweep efficiency and oil recovery in reservoirs. In the presence of oil there are three types of foam described in the figures below. 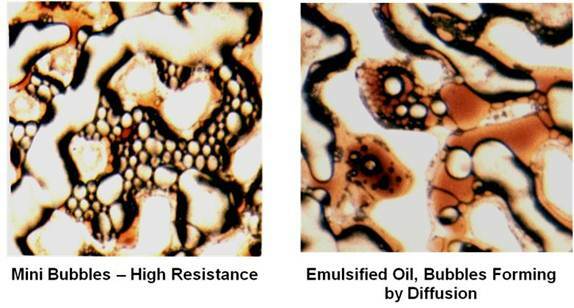 These are; a) spreading oil foams, b) foam with non spreading oil, and c) gas-oil foam in mixed-wet rock. Foam also collapses as liquid becomes less mobile, So, it is weaker at low water saturations and high capillary pressure. The following series of photographs were taken with a high-pressure micro-visual apparatus. The first of these photographs illustrates a spreading-oil foam. The figure shows bubbles surrounded by oil that spreads around the bubble moving through pore. In this case, oil-water lamella provide the mobility control and each bubble of gas is surrounded by oil. Bubbles of oil and gas are formed by snap off at small pore throats and are only stable as long as an oil-water lamellae is stable. Thus, this foam can collapse when oil water IFT’s are very low because oil coalesces easily then. The next figure illustrates gas-oil foam and shows an oil that still spreads around the CO2 but the oil is wetting the glass micro-model. Now the oil is a continuous phase and the CO2 bubbles snap off inside the oil at the pore throats. The figure shows that the CO2 bubbles are forming at a pore throat in the upper left corner of the model. 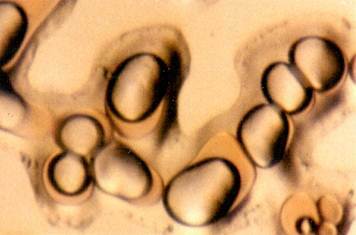 As they move through the bubbles grow, but small bubbles reform at the lower right side of the photo where oil forms a continuous phase through a pore throat. The final figure shows photographs of foam with a non-spreading oil. Oil stops spreading around oil when the sum of the gas oil and oil water interfacial tensions is larger than the oil water IFT (σwg – σwo- σog<0). That happens when the oil has a low API gravity, when CO2 has extracted the light hydrocarbons and reduced the oil’s API gravity or when surfactant is used at a high enough concentration to reduce the gas-oil IFT or high solubility of gas in water. This means for example that steam foams are non-spreading oil foams while CO2 foams with light oils begin as spreading oil foams and can change into a non spreading oil foam. Nitrogen foam, like that for Cantarell could be a non-spreading oil foam since Cantarell has a lower API gravity and N2 is not as miscible with the oil. When the oil is non spreading, the oil and gas are both surrounded by water. 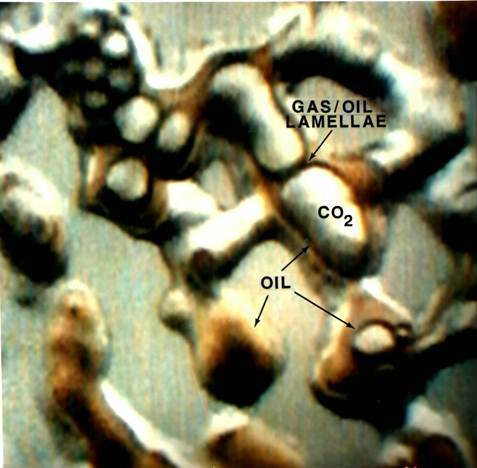 Then gas-water lamellae control the mobility of the gas and oil’s mobility can be reduced just like gas is in a foam. The photo on the left shows that multiple bubbles fill the channels, while the photo on the right shows that oil and water are dispersed in separate drops/bubbles. Because the oil bubbles are small the resistance of the foam is high. Since the oil is dispersed its mobility is also lowered.